These days you can monogram just about anything. At More Than Paper, we have over 20,000 products on which you can place your monogram. From boots to candles, mugs to necklaces, cell phone cases to calendars, monograms are a fun way to personalize things in your life and make great gifts. But the last thing you want to do is get it wrong, and monograms can be tricky. 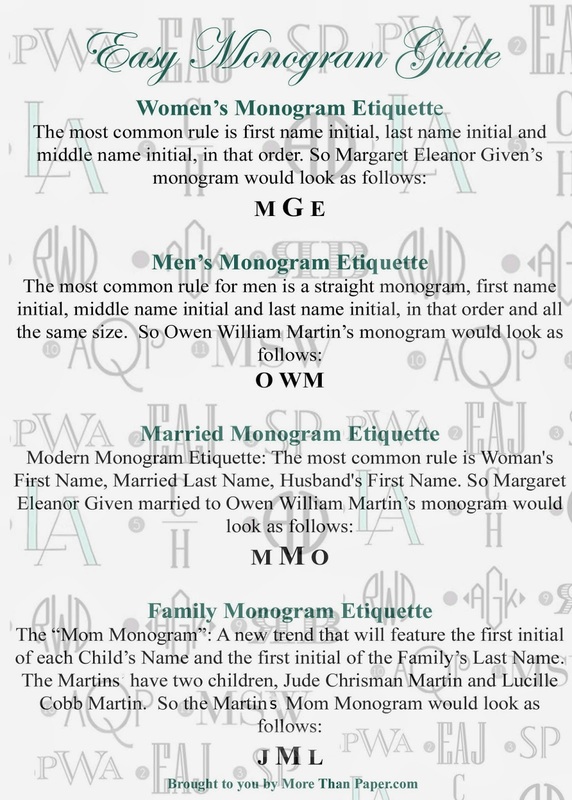 So we've assembled this easy guide to monograms. Pin this handy reference to a board on Pinterest and you'll never have questions again! When in doubt we refer back to Emily Post and remember that the lady always goes first and that the bride should refrain from using her married monogram prior to the wedding date. Also remember that the More Than Paper customer service team is always more than happy to help you with any questions you may have before ordering. What if you have more than two children. My mom has 4. How do you monogram that? This is the really great post, I like Creed Jacket I am interested in reading this post.